With all the benefits of fine Italian yarns and manufacture, Trasparenze Jennifer Merino Wool Knee High Socks are a little slice of luxury from the land of fast cars and fine wines. Trasparenze Jennifer knee high socks are matte opaque 100 denier socks, warm and comfortable thanks to the quality merino wool used. 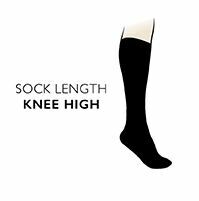 Made with comfort in mind, the tops aren’t too highly elasticised, but rely on the elastication throughout the weave to keep their hold, so this knee high sock is less likely to cut into the leg. Matching tights are also available in this style and material.